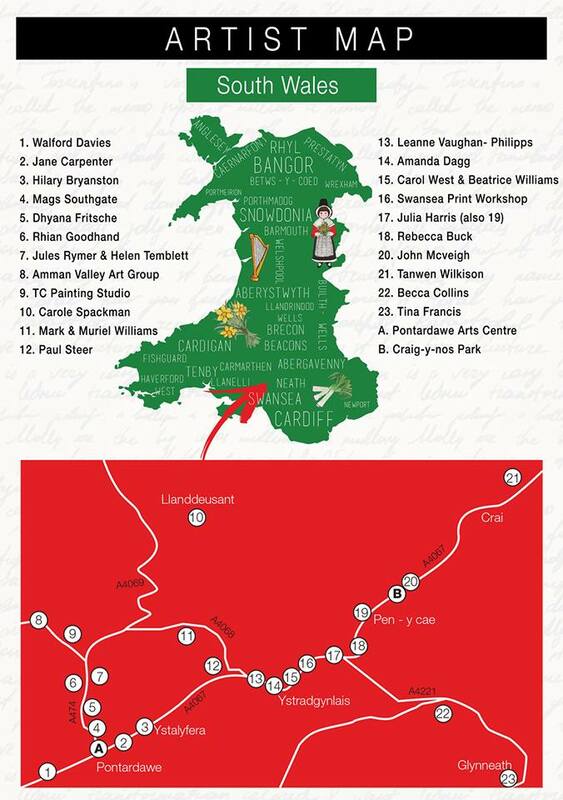 Please find a list of all the exhibitions, workshops, open studios and the art trail running during Arts in the Tawe Valley Week 11th – 19th June 2016. 7pm – 9pm Opening Evening, Arts Exhibition with many Members’ work. 10am – 12.30pm Making a Bird Sculpture with Carole Spackman £15 including 1 fired piece (£5 for glazing). Booking essential beginners welcome SA19 9UP 01550 740619 Directions to studio. 10am -1pm Clay Modelling and Sculpture Demonstration with Naomi Bunker, Pontardawe Arts Centre. 10am – 2pm Mixed Media Demonstration with Leanne Vaghan-Philipps in the Gallery at Pontardawe Arts Centre. 10am – 2pm Live doodling with Angie Stevens aka Doodle Mum outside Pontardawe Arts Centre. Get doodling! 10am – 5pm Tableware Throwing and Bird Sculpture Demonstrations with Carole Spackman SA19 9UP Directions to studio. £6 All Welcome. Berllan Las, Heol Llangiwg ,Ynysmeudwy SA8 4PL. 10am – 2pm Stained Glass Demonstration with Jane Carpenter in the gallery at Pontardawe Arts Centre. 10am – 12.00pm Art Class Painting and Drawing with Hilary Bryanston £8 all welcome. An exciting and fun family day out to celebrate the end of our art week. 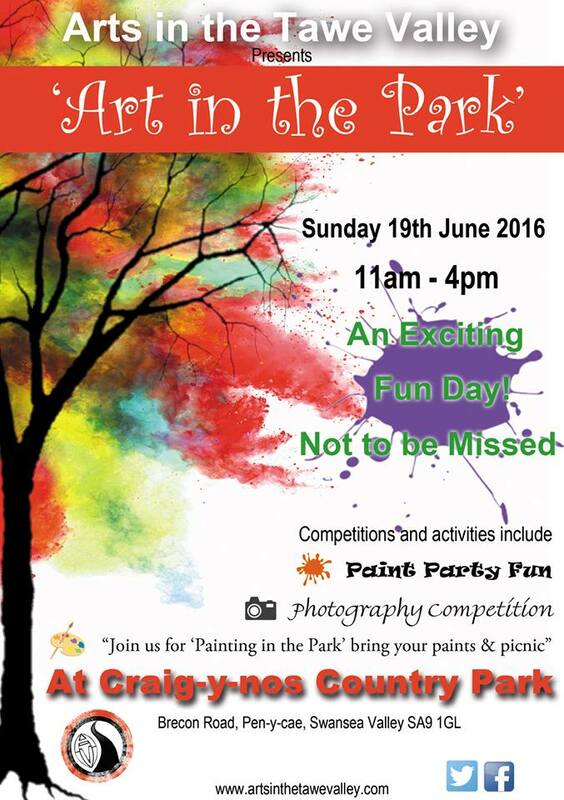 Competitions and activities including, produce your own artwork, photography competition and paint party fun. Wear old clothes for the paint party and have lots of fun. Click to see larger trail map. 12th – 18th June workshops 10 -12 daily including demos of stained glass techniques and pieces to purchase. 8. Amman Valley Art Group, Exhibition, Glanamman, SA18 1DX 10am – 4pm daily during Arts Week. 10. Carole Spackman Open studio, SA19 9UP 11th – 19th 10am – 5pm Directions to studio. 12. Paul Steer, Open Studio, SA9 2AE 11th, 12th, 17th, 18th & 19th 2pm – 4pm including demos of making and painting. 14th – 18th June 11am – 6pm including sculptures for sale. Viv Rhule, Naomi Bunker, Michelle James, Matt Botwood, Humphreys Craft, Eleanor Flaherty, and Angie Stevens aka Doodlemum, who will be sited there all week to delight and entertain you with her doodles.